Chapter One: What is the Mother-Daughter Project? Five mothers and five 12- and 13-year-old daughters are gathered around a low coffee table in Libby and her daughter Vanessa's living room, nestled in a small town in the hills of western Massachusetts. Several girls and mothers snuggle side-by-side on a comfy couch, others sit on the floor, and two mothers relax in chairs. It's September, and we are all excited to begin our sixth year of monthly mother-daughter meetings. "Imagine a day you would love," Libby begins. "Just think of a day that would make you feel really happy." The coffee table is covered with hundreds of slips of paper, each printed with a word or phrase: climbing a tree, dancing, cheesecake, ocean. The faces of the girls and women are intent as they read the words and phrases, and with Libby's encouragement, we begin making selections, going around the circle. We help each other find words on the table that describe our perfect day, trading when copies of a word are gone. Smiling, laughing, and grimacing, we watch each other choose chocolate, rainy day, roller coaster, fresh vegetable juice. "Fresh vegetable juice? Ugh!" Vanessa groans when Libby picks it. After choosing all the words we want from the table, we pass out paper and pencils. For the next ten minutes all the mothers and daughters each write a description of a day we would each love, incorporating these words, then read them aloud.
. At the amusement park I make sure I go on every upside down ride they have. I take a walk around the lake and rest a lot. I climb a tree and think for a long, long time. When I am just starting to feel lonely, I blink my eyes and I am in the kitchen singing a song with my daughters and all the people I love. Good thing someone brought homemade bread, pesto, sun-dried tomatoes, and mozzarella. Oh, and look! There's roast chicken and pie for dessert. One by one, we read our descriptions, each as richly unique as the girl or woman sharing it. Together we then consider questions such as, What are the feelings that guide you toward what you want? How did others' choices influence your choices? Desire. What do I truly want? For many of us women, raised to consider the needs of others before our own, it's a provocative question. Yes, we are hanging out and having fun with our girls, but we are also enhancing their awareness of one of the most significant and complicated aspects of being female - one that informs so many of their later choices - knowing what makes you happy, and being able to express it clearly, to yourself and to those around you. We are fascinated by what the girls and the other mothers have to say, but the quality of our conversation is equally compelling. Our daughters, our young teenagers lounging unselfconsciously in their low-riders with the requisite strip of belly exposed, actually want to talk with us, their mothers, about what they desire, why they desire it. They feel comfortable sharing things that are different from what we, their mothers, want, and even from what the other girls in the group say they desire. In this snug house, in this warm, easy moment, we are practicing a new way of being together as mothers and adolescent daughters. Welcome to the Mother-Daughter Project. Have you ever wished you and your precious girl could climb into a bubble and float right over adolescence? Perhaps you are, like we were, concerned that your daughter will become one of the girls that gets ambushed by anorexia or trapped in an abusive relationship. Maybe you worry about depression, alcohol and drug abuse, STDs or teen pregnancy. As much as we want to protect and shelter our daughters, dire warnings abound, insisting that our daughters must reject us and tear away just as they are entering a teen culture that can be cruel and dangerous. The Mother-Daughter Project presents a model of prevention. By engaging in developmentally appropriate activities with our girls and finding methods of keeping channels of communication open with them as they become teens, we have discovered how mothers can help their daughters thrive during adolescence. Together we challenge the current popular ideas about girls, mothers, and mother-daughter relationships that typically harm our daughters as they pass from childhood to adulthood. We have found, backed by the latest psychological research, that the commonly held notion that daughters need to separate from their mothers during adolescence in order to grow into healthy, independent adults is misguided and counter-productive. Instead, by teaming with other mothers and their daughters, we have created a community that supports us as mothers, empowers our daughters, and strengthens our mother-daughter bonds. 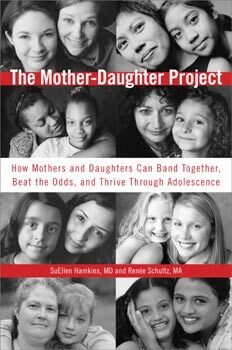 While there is no magic bullet to guarantee any girl's safe passage through adolescence, we know from our experience with our own daughters that the precepts on which the Mother-Daughter Project is based provide a strong and sturdy ship for the ride. In this safe haven, we have addressed with our daughters the most important issues girls and women face today. At the same time, in our mothers-only meetings we have offered each other the solace, comfort and practical advice all mothers need. Our group, which we simply call mom-daughter - one of the dozens of groups worldwide, inspired by the work of the Project - has been meeting in Western Massachusetts for the past ten years and continues to flourish. Our teenage daughters take time from their busy schedules to tackle such critical adolescent topics as violence and sexuality and to just enjoy the girlfriends and mothers with whom they have grown up. The closeness between us is what allows us to reach our daughters. Two years ago, at a slumber party of mothers and their fifteen-year-olds, we circled around one of the girls as we unbraided her hair, talking into the wee hours about work, money, romance, and hopes for the future. The fact that our teenage girls were not only willing - but excited! - to spend time with us is, as you may know, a monumental departure from the norm. Why does The Mother-Daughter Project succeed at empowering both mothers and daughters and cementing mother-daughter relationships? First, we create a place where it's okay to love your mom. One of the secrets we have learned through our work with mother-daughter groups, as well as from our research and observations as therapists, is that teen girls are desperate to be close to their mothers - as long as they can still be cool in front of their peers. Girls do best when they can explore who they are in the context of loving relationships with their mothers and families as well as out in the wider world. Second, we take Supermom off her pedestal and get her to put her feet up during regular mothers-only time when we share the realities of too little time and too much to do, how crazy we are about our kids and how crazy they can make us. The companionship of other mothers gives women what they need to make motherhood really work: an embracing community. Third, we address the big issues with our girls early, before they become too hot to handle - not through lectures but through humor, play, and personal stories. Later, when our daughters are faced with trying on their first bra they know that their friends and other mothers in their group believe in the beauty of every body type. When they go out with their first boyfriend, they have already thought about how to know what they want in a relationship - and what they don't want. Our book provides ideas for how to get the support you need to do the work of mothering and the tools to help you stay close to your girl as she grows up. And while you may choose to start a mother's group of your own, you can also find the help you seek through this book, by using the Project's methods and becoming a part of a world-wide community of women who not only want the best for their girls but are taking the steps to make a real difference. Finally, we offer mothers the win-win situation they have been waiting for. We support the needs and hopes and dreams of women as fully as the needs and hopes and dreams of their daughters. The solution is not about you doing more. Instead, it's about getting the encouragement and companionship you deserve as you do one of the hardest jobs in the world. Our lives are not perfect, nor are our daughters' lives, and we've experienced our share of difficulties along the way, as you'll learn from our personal experiences and those of other mothers and daughters in the chapters to come. But through the Mother-Daughter Project we've been strengthened by a family of girls and women who promote self-awareness, confidence and a deep sense of belonging at the time when girls are most prone to low self-esteem, depression and a loss of connection from who they really are.